People are speculating that the pilot cards included with the speeder will help "fix" the T-43, but that's also kind of the thing I hated in X-Wing. It's worth mentioning that for the most part from the 'old lore', the Rebels tended to rely more on things like the X-Wing and Y-Wing for support versus the ground game. It helped that they didn't have to worry as much about having bases on the planets they were fighting on. They just had to(as we saw in Rogue One) call it in. Far less of an issue as long as they avoid cross faction fixes. That said, the second pilot better be amazing. The one on top isn’t going to fix the snowspeeder one bit. I don't think you could release anything to help the T-47. It just doesn't overall work due to cost, effectiveness, and the power of standard infantry. In general it seems like it'd be good, but it doesn't bring enough firepower because of it's ability to be downed so easily. A bit of concentrated fire from Stormtroopers with DLT's and it just flies to pieces, and then you've lost the activation and infantry advantage due to its high cost to effectiveness ratio. If there were things in the backline that would be decent enough targets the T-43 would be effective but as your main army and even the support will likely be moving up, stormtroopers with DLT's backed up by their commanders the T-43 has to move to the main fray eventually. 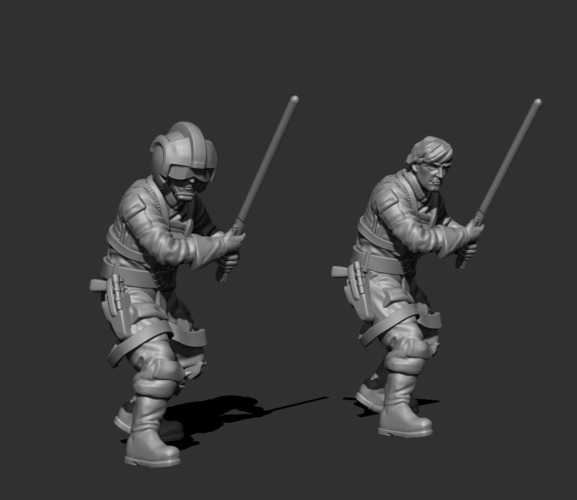 Unlike the other infantry models that have been featured in Legion thus far, it sounds like these are going to come with multiple different poses/assembly options, with Sabine either having a "gunslinger" pose with two pistols or else one pistol and her sword (as well as both a helmeted and unhelmeted option); Bossk will have either the "grenade throwing" pose shown there or a more conventional one with both hands on his weapon. That seems pretty interesting with respect to the future of the game's miniatures, especially the infantry. Bossk looks fantastic. 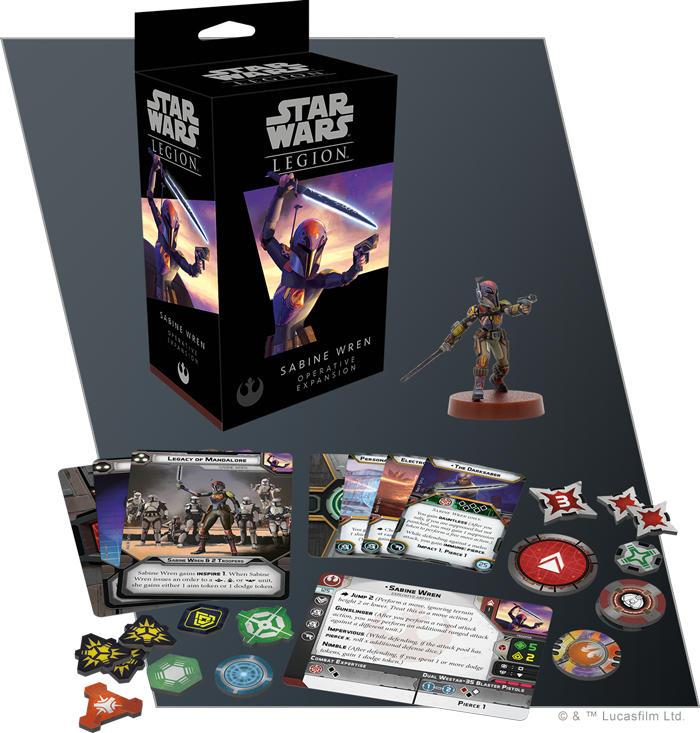 I have no interest in the game itself (I think the mechanics are rather bland, especially the dice), but I may just have to pick up one of each of the bounty hunters. 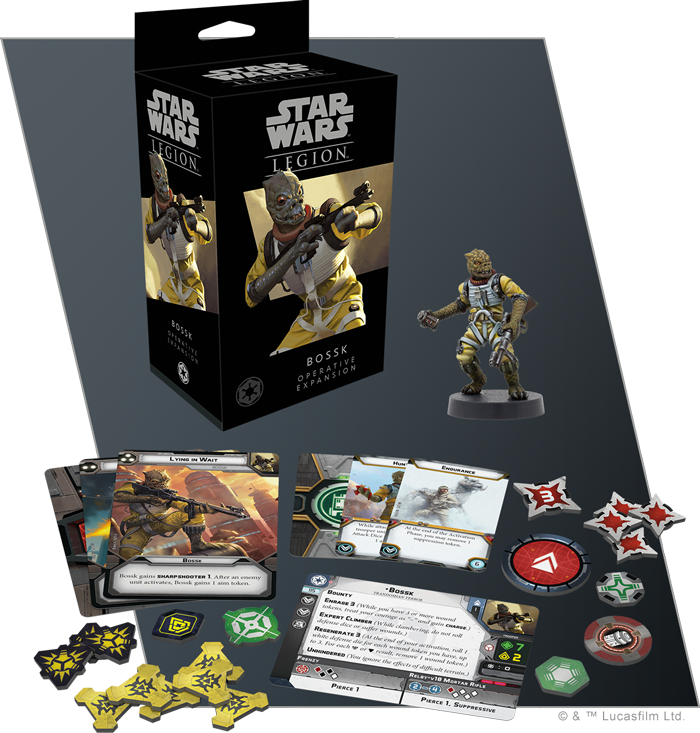 Personally, I'm thinking of picking up an extra Bossk miniature to convert into flight suit Luke. "Aren't you a little tall to be a Skywalker...?" You can just buy one from Skull Forge(Pinshape storeif you have a printer, Shapeways store if you don't). As for the characters - eh. They're nice, and I like the switch to having pose & weapon options, but I'm less fussed about named characters than I am about generics and new infantry/vehicle units. Looks like a terrain kit that comes with cards to run a two-part custom narrative scenario. $49,95 for the AT-ST, ouch. So they're already up to ruined versions of the limited units they have? Don't worry, God willing, we'll all meet up in Star Wars Legion 2: The Search for More Money. Now in 45mm scale, or whatever stupid size to ensure it isn't compatible with your previous purchases, terrain, etc. How else can they sell the exact same stuff yet again? Well all games have a limited number of units. 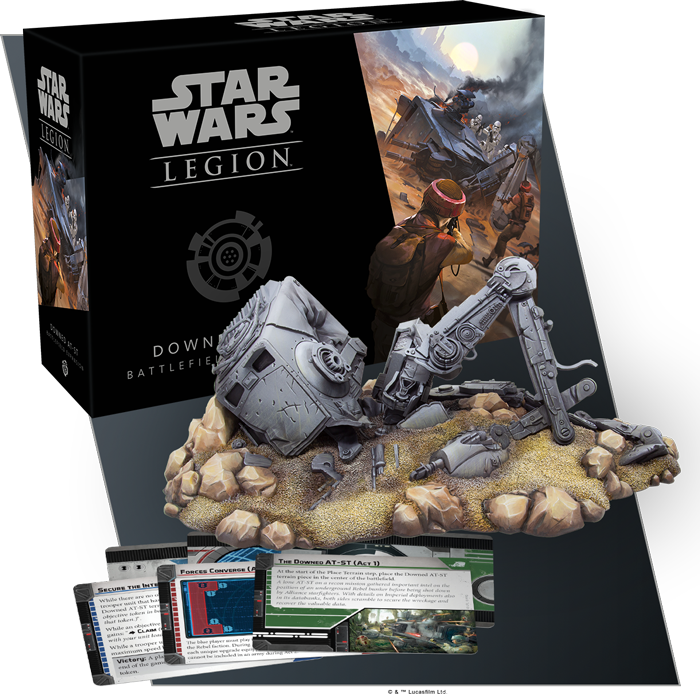 I think that SW Legion has a respectable number of units at this point. For example the rebels have Luke, Leia, Han, Spec Ops, Chewie, Troopers, Fleet Troopers, Commandos, Wookies, Canon and the Walker. While I would personally like more units rather than destroyed ones, I also believe that scenarios are important, and it is good to see that FF also believes that they are important as well. This is not to defend some of FF bad decisions, such as the scale change, or card system in xwing, but I think that everyone who went into Legion was aware of these sorts of things from the start. If you approach it casually it is not an issue. Looks like a fun terrain piece. I like it. That's honestly the one thing that would make me look at this game more seriously if they introduced Clone Wars. I do think Clone Wars would have been a better starting point, but theres still lots they can do in the GCW era just by drawing from the movies and TV shows. besides iconic stuff from the original movies we haven't seen (Lando, Ewoks, Imperial Fleet Troopers, Hoth Rebels, Sand Troopers, Dewbacks, etc) there's still lots of stuff from Rebels, Solo and Rogue One to be done. I imagine they could continue their current release schedule for at least 2 more years before the well runs dry and they have to resort to doing new version of existing characters (RotJ Luke or Bounty Hunter Leia ) or stuff we've only seen in expanded universe. As far as the Empire lacking Iconic heroes go, they have plenty of non A-list options. Thrawn and Tarkin, Agent Kallus, Grand Inquisitor, 5th Brother, 7th Sister, 8th Brother, Governor Pryce, Valen Rudor, Minister Tua and Wulf Yularen. Any of them would make solid characters for Legion. Thats not counting and of the named officers form the OT, or any more bounty hunters, or any of the Mandalorians. I think the development team got the memo, that the prequels are trash and are hated now, long ago. But sticking just to the "originals" for a wargame might turn out to be a big mistake. Take it you don't follow legion? Clone Wars has been announced for ages, same time as for X-wing thought he first releases there are immanent. Nope! But that sounds good for the game! I wonder if they`ll make LAAT Gunship. Oh they'll make a LAAT. It'll be huge and ridiculous, but it'll be made and sell like mad. That said, it looks like they're using the smaller sized versions of the clone wars vehicles, all the clone wars stuff has a lot of issues with having multiple depictions at different sizes due to all the different media it's been in. The AT-TE they've had in art definitely uses the smaller version that's close to a tank size. Aren't they bringing out a TV Show about Boba Fett? That looks cool, could make for good material to draw on for Legion. Ditto for Solo: A Star Wars Story. In fact you could probably eventually add a third faction of "Scum and Villainy". Hutt Gangs launching ambushes on Imperial patrols etc. Deals gone wrong between Rebels and Criminal Gangs. Darth Maul's gang the Crimson Dawn. And Rogue One, which they still haven't exploited fully (just Jyn Erso, Director Krennic, Pathfinders and Deathroopers so far. But where is the rest of Rogue One, and the Shore Troopers? Saw Gurera and the Partisans?). Theres tons of stuff they can still do with OT. And then there are the Disney Sequels with the First Order and Resistance (not that I give a gak about those movies but a miniature Kylo Ren would still be cool). Imperial army from Solo would be great models. Imperial Army are the one thing I really want to see out of FFG before they backburner the OT and start pumping out Clone Wars stuff I have little interest in(I like the CW era just fine, but I don't care about it enough to spend a fortune collecting models about it).